Information stored in the activity patterns of cerebral cortex neurons is discarded at the surprisingly high rate of one bit per active neuron per second, scientists from the Max Planck Institute for Dynamics and Self-Organization at the University of Gottingen and the Bernstein Center for Computational Neuroscience Gpttingen have found. Older models described the neurons in a very simplified form and did not take into account exactly how and under what conditions a spike arises. “This gave rise to stable dynamics in some cases but non-stable dynamics in others,” explains Michael Monteforte from the Max Planck Institute for Dynamics and Self-Organization, who is also a doctoral student at the Göttingen Graduate School for Neurosciences and Molecular Biosciences (GGNB). It was thus impossible to resolve the long-established disagreement as to whether the processes in the cerebral cortex are chaotic or not, using these models. 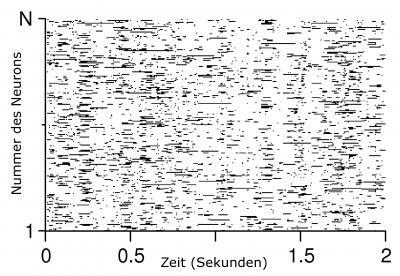 Thanks to their more differentiated approach, the Göttingen-based researchers were able to calculate, for the first time, how quickly an activity pattern is lost through tiny changes; in other words, how it is forgotten. Approximately one bit of information disappears per active neuron per second. “This extraordinarily high deletion rate came as a huge surprise to us”, says Wolf. It appears that information is lost in the brain as quickly as it can be “delivered” from the senses. This has fundamental consequences for our understanding of the neural code of the cerebral cortex. Due to the high deletion rate, information about sensory input signals can only be maintained for a few spikes. These new findings therefore indicate that the dynamics of the cerebral cortex are specifically tailored to the processing of brief snapshots of the outside world.